Unika Charity to host a free for all Music Festival on its 3rd Anniversary. 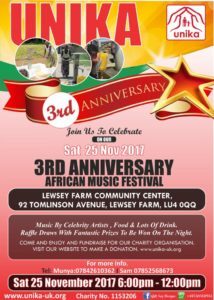 UK based charitable organisation Unika, will on November 25, host a free admission African Music festival to celebrate its 3rd Anniversary, in Luton, Bedfoshire courtesy of the Big Lottery Fund who has financed the event. The free for all music festival is expected to attract people from all walks of life and will be graced with a marathon of an action – packed music bonanza performed by UK based celebrated artists and with lots of sizzling Food & drink. The anniversary will take place at Lewsey Farm Trust, 92 Tomlinson Avenue, Luton LU4 0QQ from 18:00 – 23:30 GMT. Founder and Trustee of Unika Charity, Munya Sajanga says that this year they have decided to bring the splendour of the African cultural heritage into the celebration through music, dancers, poets and exhibitors from different countries so that they can celebrate each other’s different cultures and bring about unity and togetherness amongst communities from different cultural backgrounds, she says adding that everything has been fully funded by the Big Lottery Fund. Also performing on the night will be the Zimbabwean born Multi – talented Reggae Superstar, Mathias ‘Matty’ Julius, Kudzie Max and the Limpopo Groove from Reading. The night will also be graced by TFL Poetry winner of the year, Neb Moyo and Tene. Yet another inspiration of the night will be the marvellous Afrizz dancers that will take the night away with their afro beats dance moves. 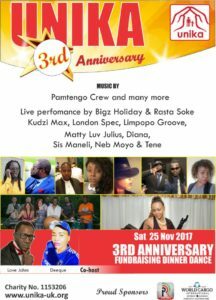 The Anniversary celebration will be supported with sound engineering by Pamtengo Radio. Unika is aimed at building a socially inclusive society where all people feel valued regardless of individual differences. Since its inception three years ago, Unika has been helping the elderly and the communities to claim their rights, challenge discrimination and overcome poverty thereby fostering dignified, secure, active and healthy lives in the UK and developing countries such as Malawi and Zimbabwe in Africa. With its continued efforts to building a socially inclusive society where all people feel valued regardless of individual differences, Unika continues touching lives by offering Christmas dinners around Luton for the elderly during festive seasons and supply of clothing to the communities. Besides, Unika has also constructed 7 boreholes in Nathenje, Malawi that caters for safe and clean drinking water for the communities. Sajanga says Unika believes in helping people earn a better living through responses to tackling abuse against the vulnerable and undertaking humanitarian work adding that her charity is also involved in other projects such as ALTEREGO (Fight Against domestic abuse) health care services that includes provisions of preventative and educational programmes relating to HIV/AIDS but also Pamtengo Radio disc jockeying Training Project being funded by Big Lottery. ’’We have practical practical lessons offered on disc jockeying skills, broadcasting skills and presenter skills to the disadvantaged young adults from the black and ethic minority communities, who have a deep passion for music and related fields in a skill based programme’’says the Unika Boss. For bookings for a free ticket register on the eventbrite on the following link: https://www.eventbrite.co.uk/e/africa-music-festival-tickets-38047137011. ANY DONATIONS ARE WELCOME. 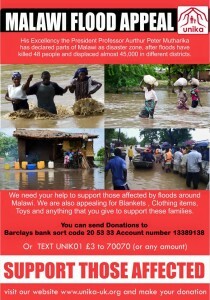 HELP US SUPPORT THOSE AFFECTED. 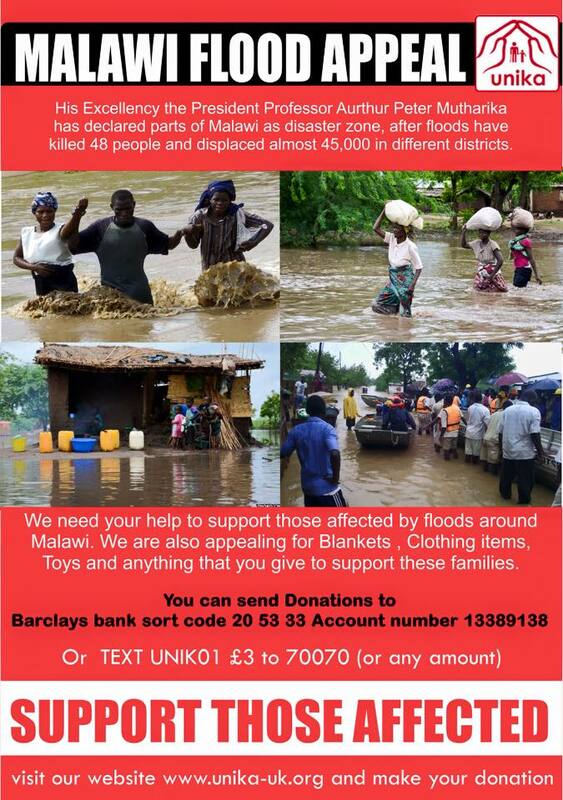 His Excellency the President Professor Aurthur Peter Mutharika has declared parts of Malawi as disaster zone, after floods have killed 48 people and displaced almost 45,000 in different districts. We are appealing to all of you out there to give us your unwanted clothing , toys , blankets and funds. Your help is greatly appeciated.